Yesterday I described how a series of important security-related public policy documents had been effectively ‘tabled’ in public before the Parliament had seen them. In the case of the National Security Statement, it never made the table in Parliament at all. Now the dogs are barking and the Canberra system is whispering that the trick is about to be repeated with the public release of the new Defence White Paper in the next fortnight, before Parliament assembles on May 14 for the Budget sessions. The whispers have it that the Government wants to announce the White Paper ahead of the Budget, instead of late June as previously stated by the Defence Minister, ‘so it doesn’t clutter post-budget discussion of more electorally saleable issues’. The Navy would be well advised to have a ship on standby so it can do picture duty as with the previous White Paper. The Presidential Pretensions that have long afflicted Australian Prime Ministers feed a desire to rise above the clutches of the Parliament. The way caucus cut down ‘President’ Rudd in 2010 and Labor’s constant vigilance on the floor of the House of Reps to sustain a minority government this term don’t seem to have had much effect on the hankering for the Oval Office. 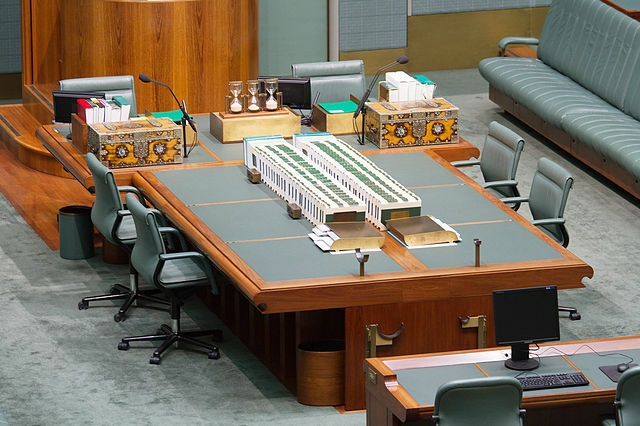 Canberra has cherry-picked some excellent elements from Washington, such as the formation of the National Security Committee of Cabinet and in the creation of the post of a National Security Adviser. The US President issues a National Security Strategy (PDF); what could be more natural than for the Australian President to do the same? PM + Navy ship + Sydney Harbour = Great Pictures! = Good win. The Presidential Pretensions and the Minder Mentality don’t mesh easily with the operation of the Canberra system and the functions of Parliament. The two tendencies are more than just a break with history—beyond disrupting process, the Pretensions and the Mentality don’t always or naturally generate good policy or even successful political strategies. To teach Oz Politics & Government 101 for just a moment: the Australian Parliament produces laws, leadership and legitimacy, and it packs much of this substance and its symbols into the one building; the House of Representatives, the Senate and the Executive all nestle beneath that one huge flagpole. Shutting the Parliament out of doing the thinking about Defence and National Security ignores the basic workings of this system and denies the executive the usual benefits of legitimacy and legitimisation of policy. It might be surprising, but having a Parliamentary stoush rather than merely chanting the message-of-the-day can light up an issue and help improve a policy. Ever ready to help, ASPI has been musing on the natural part Parliament should have in such major matters. And these are ideas that don’t require any new dollars to be spent; that’s really unusual in this game. For a start, see Peter Jennings thoughts on the need to strengthen Parliament’s role over military operations. My extra (no cost) idea is that the Labor and the Coalition should pledge at the next election that future White Papers and National Security Strategies will be presented and debated in Parliament. It should be an easy pledge, given that’s the way the system is supposed to work. Add to this a further commitment to what the Gillard Government has already indicated: these White Papers and Strategies will be synchronised and issued in a five year cycle. To augment this process, the Parliament’s Joint Standing Committee on Foreign Affairs, Defence and Trade should hold an inquiry and a series of public consultations every five years to assess the White Paper and Strategy. A political pledge that makes for good process and improves policy without costing a dollar: What President or Minder could object?